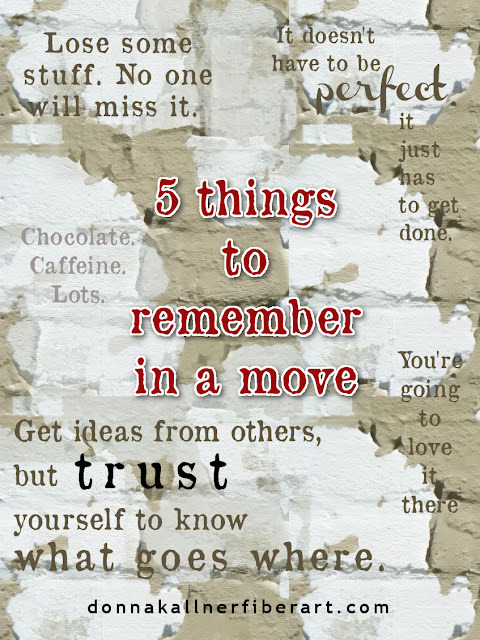 In case you missed it earlier, I've moved my blog to http://donnakallnerfiberart.com. Hope you'll stop by there to catch up on the latest news and say hello! I've done it: I've moved to donnakallnerfiberart.com. That's where I'll be posting from now on. Was I successful in redirecting Two Red Threads subscribers to the new feed? I did try, would you please click this link and subscribe for yourself? That way, I can head back to the studio and get back to posting about looping, natural dyeing, making gifts, and making the kind of fun messages you really want to read about. P.S. I've posted a bunch of free videos for you at donnakallnerfiberart.com. And bibliographies. And much, much more. Please stop by and say hi! Things have been pretty quiet around Two Red Threads lately because I'm getting ready to move. I've been "digital sharecropping" on Blogger since 2009, and jerryrigging a web site built with software published when social and media were two separate things. Last month it was finally time to make a change. I researched new web hosting options and started to designing and build brand, spanking new sites for myself and the small manufacturing business my husband and I own. I've made good progress and boy, have I learned a lot. 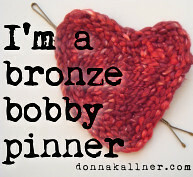 Are You A Bronze Bobby Pinner, Too? I made a couple of hearts yesterday, using the flat panel technique. We spent the day in Minneapolis. I took my looping supplies. When I sat down to get started, while Gordon did some maintenance at our daughter's apartment, I realized I had not included tapestry needles in my looping bag. I stitched two hearts using a bobby pin instead of a tapestry needle. It worked, but I don't recommend it! Do I get an A for effort, teach? A for effort, a gold star, high fives, and the 1st Annual Bronze Bobby Pin Award! 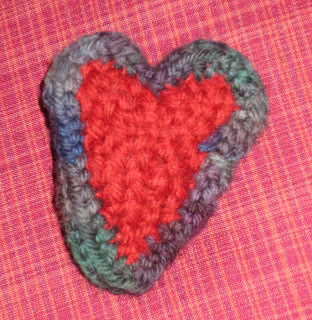 This is the heart that I completed. The red looping was done using a bobby pin in place of my forgotten tapestry needle. I was bound and determined to get my homework done. The edging was done with the needle. I did give it a bit of stuffing between the silk backing and cross-knit lopped front. I did stitch a pin to the back. My other bobby pin sample heart is tied to our daughter's collar. That's how the Bronze Bobby Pin Award began. Congratulations, Val, and thank you for inspiring us all! Do you have a resourceful, can-do attitude, too? Are you the type of person who could rip up a floorboard to find a needle, or stitch with a bronze bobby pin, if necessary? If you are, grab a Bronze Bobby Pin badge from the sidebar and share your story in the comments below. We <3 inspiration! Teaching left-handed when you're not is a great reminder of how students often feel -- awkward, uncertain, maybe anxious, or a little embarrassed. Between the e-course I'm teaching and the e-course I'm taking, this week I've felt all that. With years of practice, I've learned to give reasonably fluid demonstrations of left-handed looping techniques, even though that hand is not naturally adept at the fine motor skills of manipulating a needle. And from years of teaching workshops in person, I know most of my left-handed students are adept at translating righty into lefty. So once the basics are established, most offers to show variations left-handed are met with, "No, thanks, I think I've got it." Not this time. 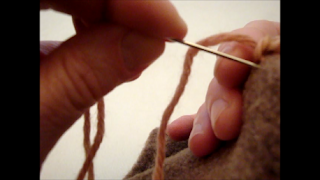 In my new cross-knit looping eCourse, I could tell from students' comments and questions that I needed to add a left-handed cross-knit edging video. Sighs of relief echoed across the interwebs when I said I would add one next week. They waited patiently. I shot it. I reshot it. And reshot it again. And finally, after two weeks, it went up on the course site. Ginger Rogers made dancing with Fred Astaire look effortless, and she did it backwards and in high heels. In my own little fantasy world, I work to create a Ginger-esque sense of seamless fluidity in the content I produce for my eCourses. Sometimes, when I stumble (and I do) I save that footage for a gag reel at the end of a course. Not this time. I've emptied a digital trash bin full of left-handed looping video. Such poor modeling could only confuse students further. Back of my hand video -- not instructive. Because I was so awkward, I kept moving the piece out of the camera's frame and closer to my bifocals. I hit the lens with my needle at least once. Practice. Unbelievably, I started shooting the first version without first warming up on a left-handed edging practice piece. Believably, it was painful to watch the playback of that footage. I deleted that stuff right away, then practiced before shooting Version 2. Choose Easier Materials. I generally use different colors for right- and left-handed demonstrations to help me keep things straight in my head. Because I felt some time pressure on this video, initially I went with materials that were close at hand and "close enough." That was a waste of time. In left-handed demos, my most awkward moments (and this is saying something) are threading a needle and piercing anything with a needle (in this case, felt). Eventually, I got different felt. And I allowed myself to bury the tail (that piercing thing), with my right hand. My left-handed demonstration skills are not as fluid as would like, so I'm going to start by showing how the stitching looks once you get going on an edging. Then we'll go back to how to begin and end. In some ways, I think I'd like to alter the progression of the Massive Open Online Course I'm taking, too. And as an academic exercise, I can understand why the course is structured the way it is. But for much of the first two weeks I've felt like a lab rat in someone's Massive Open Online Research Project. It's not that I lack the wit or the will to operate in a self-directed learning environment. Frankly, I've done just that for years while cobbling together bits and pieces of references on a relatively obscure specialty. For me, that kind of learning generally produces excitement, anticipation, the thrill of discovery -- not the awkward, uncertain, anxiety I've felt in the #EDCMOOC. In other words, I've felt like a right-handed stitcher demonstrating left-handed. If I could alter the progression of the course, I would take some of the energy put into the first week's live chat session (recorded here), and put it into producing video introductions to aspects of the material by individual members of the instructional team. Yes, some students might hate the "sage on a stage" model. And they could ignore those course elements. As for me, I would appreciate some talking heads. Their absence feels too much like the reluctance of lab assistants to interact or influence their subjects. In a class of 40,000 students, I don't really expect my comments or questions to result in an addition to the curriculum while the course is under way. But I do suspect the instructional team is feeling their share of anxiety about how this is going. Does Doodling Enhance Learning For You? What do you do for 10 hours in an airport when one flight after another is canceled? Normally, I would pull out some stitching. But this week, weather-related travel delays gave me a block of time to study for an online course I'm taking. It helped that I found a relatively quiet spot, one private enough that I wasn't too embarrassed to move my lips as I tried to make sense of what I was reading. There are different ways to achieve a goal (i.e. with and without soil). Ideas, like plants, need time, resources, and care if they are to grow and flourish. When resources are limited, you have to choose what you will nurture. The most helpful (to me) element of the course so far came from a post in a class forum by a student, which led me to this video on "visitors and residents" and online engagement. So what does all this have to do with doodling? I got to thinking about how being tethered to my laptop precludes movement, which I find beneficial for learning (at all ages). I'm probably not coordinated enough to watch videos and interact with the class community while walking with a cell phone in hand. But some type of movement might be possible. Or open a separate window in your browser to Pencil Madness, a free online sketching tool. (You can "deny" Adobe Flash permission to store information on your computer and still use the tool for this experiment.) If you're using Pencil Madness, click one of the three tools at the far right of the menu bar below the canvas. 2. 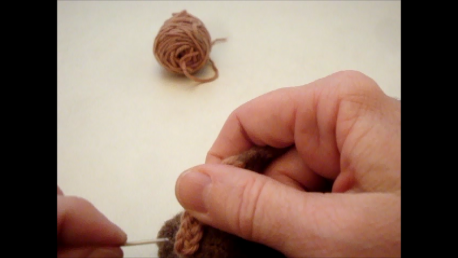 Launch a video: Click this link to launch an 8-minute video on splicing wool yarn and winding center-pull balls, or view it in the embedded player at the bottom of this post. 3. Doodle while watching the video. 4. Answer a few questions. Click this link to open a short survey. The survey is anonymous. Even if you don't watch the video or take part in the survey, I'd love to hear what you think: Does doodling enhance learning for you? Cross-Knit Looping: How To Splice Wool Yarn & Wind Center-Pull Balls from Donna Kallner on Vimeo.